These are all my cars I run. From Sprint Cup, Nationwide, etc. Any scheme I run will be posted here, along with the download. Well, this year I figured I'd start my quest in NASCAR. After a few years of limited success, and very small schedules, I decided I'd try to commit to a limited schedule that saw me run most races as long as sponsor dollars would allow it. With the COT coming into NASCAR, I needed to find someone to buy from. Lucky for me, Joe Gibbs Racing and Hall of Fame Racing were switching from Chevrolet to Toyota. 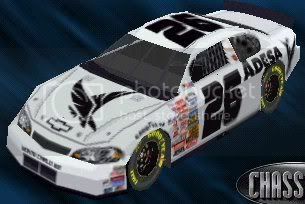 A few dollars here and there an I purchased 4 chassis; 2 from JGR, 1 from HOF, and I managed to buy one of RCR's CoT's meant for the 33 team. Because of certain teams having certain numbers, I was unfortunetly not able to pick my family's honored number 26. So, I decided to simply reverse things, and use #62. 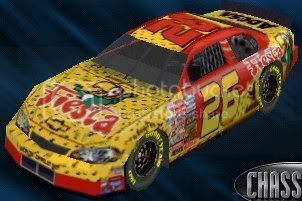 However I did call Jack Roush and told him if he ever thought of changing a number, or dropping a number, I suggested the 26, or that I would by the number from him. 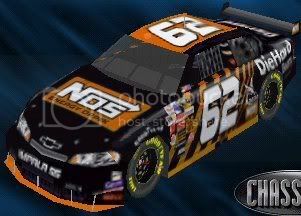 Starting off with little sponsor back up, this would be my main Nationwide Series ride. 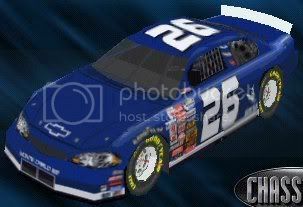 Painted in my traditional blue and white colors, and since no one had used the 26 in Nationwide races, I'd be able to adorn my trusted number. For Daytona, and several other races during the year, my former employer Adesa Car Auctions sponsored both my Cup and Nationwide rides. Adesa has contributed greatly to Powers Team Racing, sponsoring not only our Cup and Nationwide rides, but our Sirius Pro Cup Series, SKOAL Super Stock Series, Hooters Pro Cup Series, and pretty much every series we run in. After the first couple of races, I was approached by my father inlaw about sponsorship. I told him besides Adesa I didn't really have a lot of sponsors. Now my wife's old man is a big shot at SEARS, and he told me they were looking to get back involved in NASCAR's biggest show, and asked what I thought about a deal. Ofcourse I jumped all over it. So Sears agreed to sign a 2 year deal for atleast 8 races each year in Sprint Cup, and selected races in Nationwide races, to put their DieHard Batteries company on the car. 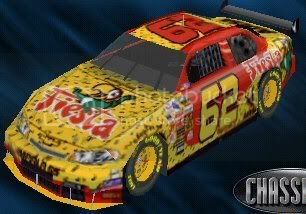 Since I was only running a limited schedule, and would only consider doing more races if sponsors became available, I wasn't really "looking" for a sponsor in Fiesta. I was attending a Monster Truck show for Monster Jam, and while there came across the King Krunch Monster truck team, and their sponsor Fiesta. After a brief conversation, I invited the Fiesta reps to the Sprint Cup Texas race, which I was going to be running in my unsponsored Chevrolet. After a solid top 10 performance, Fiesta asked if I had a sponsor for the second Texas race. Before I knew it, we had signed a deal for Texas, the Nationwide Texas race, and a possibility for Phoenix and Homestead. After Stanton Barrett failed to qualify for the Coca-Cola 600, NOS Energy Drink quickly contacted all other teams seeing if anyone would let them sponsor them. The 600 is one of the biggest races of the year, and NOS wanted to be in on it. Lucky for them, SEARS is a very easy sponsor to get along with, so after a quick re-decaling of the car, NOS, aswell as Powers Team Racing, were in the 600!